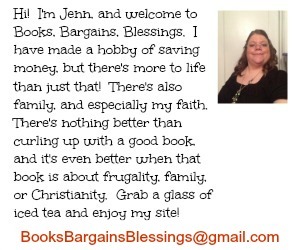 Books, Bargains, Blessings: Thoughts on a washing machine overflow. . . Thoughts on a washing machine overflow. . .
My boyfriend recently moved into the guest room in our house. My mother is on dialysis and recently had major heart surgery. I am thankful for the extra pair of hands to help out. I had been riding along when taking my mother to dialysis appointments (20 minute drive each way.) She told me last night it wasn't needed and so I decided to stay home and get some stuff done today. I got up, brewed a pot of coffee. We don't have a dishwasher (unless you count my boyfriend and me!) I did as many dishes as our drainer could hold, and then I started prepping the tuna noodle casserole I will have ready for when he and Mom arrives home. I decided to be extra Donna Reed-ish and started the bread machine. Then I went to the laundry room. I had spilled a huge pot of water the other night while doing dishes. We used every towel in the house we could find to clean up the spill. I had thrown them in the washing machine, and then I discovered they were frozen in there! So I thought the way to get them out was to run them through again. I started the machine and then headed to the living room to sit down with a cup of coffee and enjoy a productive morning before I went upstairs to pack the eBay item that sold so I could get it mailed today. I don't yet know why the washer overflowed. Maybe even a burst water pipe. The temperature was down to minus thirteen degrees the other night. All I know is there is water in the washing machine, I wrung out the towels that were in there, threw them in the dryer (we'll need something to dry ourselves after a shower). I'm leaving that for my boyfriend. And while I'm thinking "For this I went to college"? He is probably thinking similar.